Our dependency on the smartphones is increasing day by day. Peoples are likely to spend more and more time on their mobile screens than ever before. But what if you are away from your home and office, and your phone battery dies? It can be really a very frustrating experience especially when, if you have an important meeting or a conference, or otherwise you are traveling somewhere or having a trip. In that case, we need the energy to power our smart devices. With the technological advancement, it is now very easy to charge your smart devices anytime and anywhere. Yes, I am talking about the Solar Panel Chargers which are now becoming very popular. This eco-friendly device lets you charge your devices by means of sunlight and no electricity is needed. In this review I am going to discuss about one of the best solar panel chargers- Anker 21 W Dual USB Solar Charger. It is America’s leading USB charging brand that offers faster and safer charging with advanced technology. In terms of price and energy output, this one is excellent portable solar charger to consider. 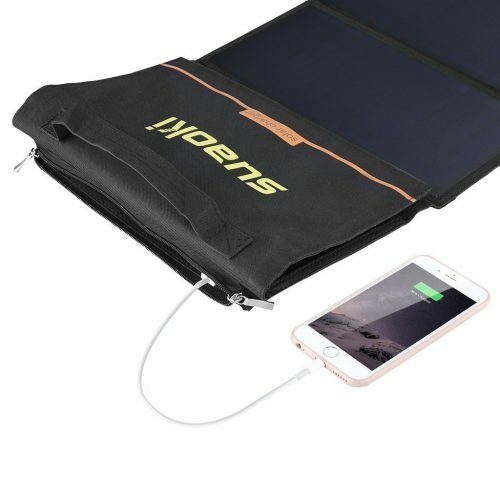 With this solar charger, you can charge a basic Smartphone in about 2-3 hours from 0-100% battery capacity under direct sunlight. But in case if there is a cloudier condition, it will take somehow longer. The Anker 21 W Dual USB Solar Charger is equipped with industrial-strength PET polymer faced solar panels stitched into a rugged polyester canvas that offers weather-resistant outdoor durability. There comes the two charging ports enclosed in a large pocket that are pretty enough to hold most Smartphones. You can charge two devices simultaneously. Also, there is a small hook and loop that will hold the pocket shut with a phone inside. The solar panels are folded up very nicely into a compact carrying case when not in use. Whether you are a hiker who needs a way to keep your devices fueled during extended camping or hiking trips or even a camper who plan on being stationary, the Anker 21 W Dual USB Solar Charger is worth to invest in. If you’re looking for a smart way to keep your Smartphone topped up during the middle hours of the day, and also for a reliable and trusted brand, this one is a great product. It is incredibly portable, and the price is extremely reasonable.